A Mojo Bag is a personal talisman bag made in order to help obtain a specific purpose. This purpose can be a range of things from sleep, love, protection, abundance, protection, luck etc. 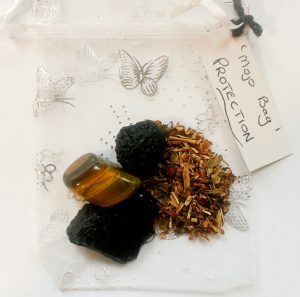 A Mojo bag is traditionally a small bag that will contain a combination of botanical, mineral or animal ingredients that are associated with the intent behind it. You can also add to the Mojo bag as you feel the need. An Organza bag to keep the ingredient in.